LANSING, Mich. — State Sen. Aric Nesbitt on Wednesday was sworn in to his first term as a state senator, representing the people of Allegan and Van Buren counties, along with parts of Kent county. He was sworn in using his great-great-great grandfather Thomas Nesbitt’s Bible, printed in 1834. 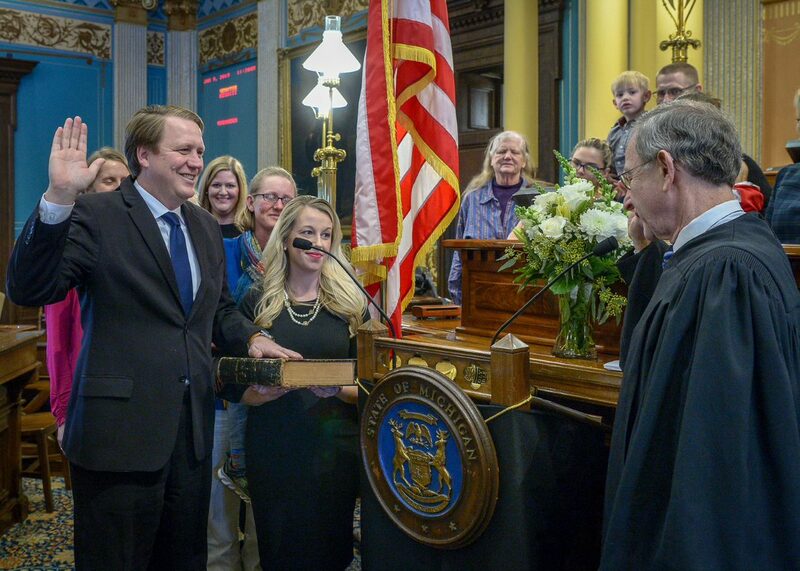 Michigan Supreme Court Chief Justice Stephen J. Markman, who was Nesbitt’s constitutional law professor at Hillsdale College, administered the oath of office during a ceremony at the state Capitol. Nesbitt was previously elected by his Republican and Democratic colleagues to serve as Senate president pro tempore. Following the swearing-in ceremony, the 100th Legislature convened for its first day of business. Editor’s note:A print-quality version of the above photograph is available by clicking on the image or by visiting the senator’s website at www.SenatorAricNesbitt.com. Click on “Photos” under the “In the News” tab. Photo caption: State Sen. Aric Nesbitt, R-Lawton, was joined by his wife Trisha, along with several friends and family members, for Wednesday’s swearing-in ceremony at the state Capitol in Lansing.